Why Attend Agile Development East? 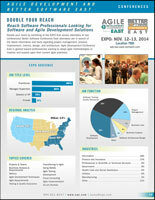 The Expo, November 12–13, 2014 gives vendors access to both Agile Development & Better Software Conference East delegates. Companies with software development products and services will certainly benefit from direct sales interaction with this highly targeted and motivated audience—the majority of whom spend at least 60% of their work effort managing or implementing software.